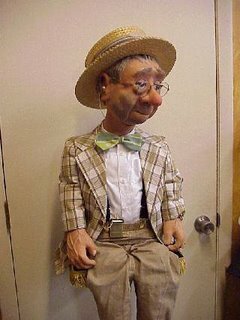 Uncle Sweeter Dabney is just about completed. I wanted to add details to his outfit. 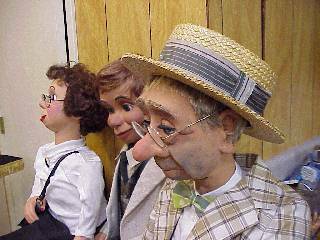 These things are not always visible or obvious to an audience viewing him onstage, but I know about them, and it makes character development easier when the figure is more realistic to me. To begin with, he needed a white dress shirt and a straw hat. The blue turtle neck wasn't making it. I bought this shirt at Wal-Mart. The 24-month size is perfect. The neck fits nicely and the sleeves are the right length. I found the straw skimmer hat on ebay. Most such hats are too big. This one is the smallest size I've seen. New ones are expensive, from $75 to $95 online. I didn't want a new one, though. Uncle Sweeter wouldn't wear a new hat. This one is stained and slightly beat up. Perfect. 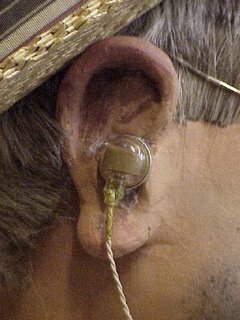 Uncle Sweeter's original hearing aid was homemade. I sculpted the earpiece from casting medium and made the receiver from cardboard. I wanted the real thing. I found this Zenith hearing aid on ebay. It's about 40 years old. I like it's golden shine. Note the suspenders. They are from Wal-Mart, too. One last detail needs to be addressed. 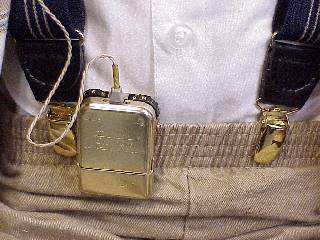 If you have pants with an elastic stretch waistband, why do you need suspenders? I'll be watching the thrift stores for a more appropriate pair of pants. You can't see them, but Uncle Sweeter has socks at last. Argyle socks. Of course. What else would he wear?